insufficient to raise water to much height. It rarely exceeds 3 atm. 13tu a pressure of about 20 atm. is required to raise the sap to the tops of tall trees. Root pressure shows seasonal fluctuations. New Ica% es are coming out and transpiration is slow in spring. Sc) it is highest in spring. But transpiration is very rapid in summer. So it has lower value in summer. .1 herefore, it does not play any role in ascent of sap in summer.
. Root pressure has not been obsened in g.,mnosperms. I. .1.11c capillary bore of xy lem )essels and trachcids is about 40m in diameter. Its capillary force can raise ,yater on Iv up to 40 cm. 2. 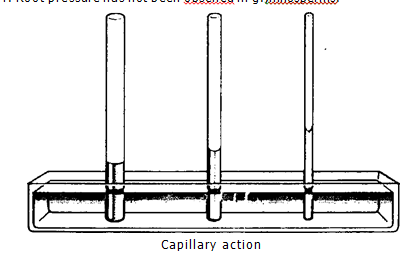 Capillarity works only if one of the open ends of the capillary tube is dipped in water. But this situation does not exist in nature. The xy lcm ducts of roots are not in contact with liquid water of the soil. Strasburgher disapproyed this theory. I le showed that water continued to rise in plants after death of their cells. negative pressure or pull or suction is created in the leaves as a result of transpiration pulls the water upward. According to this theory lbllow ing factors play role in the ascent of sap. transpiration. It produces negative pressure or suction pressure in the leaf. This pressure pulls the water upward. Cohesion: The force of :attraction among the water molecules is called cohesion. The cohesion holds water together. It forms a solid chain like column within the xylem tubes. .[here is hydrogen bonding between the molecules of water. Tension: The pulling ofw liter upward produces tension in the xylem tubes. The transpiration provides the necessary energy or three. The hydrogen bonds between. the water molecules produce this tension. the xylem Ysater tension is much stronger. It can pull the ‘Yater up to 200 meters (more than NO feet) in plants. Adhesion: The attraction between the water molecules and the cell wall of the xylem cells is called adhesion. The water molecules remains adhere to the xylem tissues. So the column of water in the xylem tissues does not break. The composition of the cell wall provides this necessary adhesion for the water molecules. It helps the water molecules to creep tip. The cellulose of the cell wall has special affinity with water. Cellulose can imbibe water. Strong xylem wall: The xylem walls have high tensile strength. So they do not buckle inwards. :[he lignin and cellulose provide strength to the cell wall of the xylem tissues. I. Mesophyll cells: Water eyaporates from the intercellular spaces of the leaves into the air. It w ithdraws water from the mesophyll cells. The water vapours pass out through the stomata. More water evaporates from the saturated walls of the mesophyll cells. The cell walls withdraw water from the vacuoles of cells. Hence the osmotic pressure of inesoph>II celk is increased. and their turgor pressure falls. It increases their suction pressure. Therefore. these cells ithdraw water from the deeper inesoph) II cell. In this a gradient of suction pressure is established. Xylems: This suction pressure reaches the parent)) ‘flaunts cells. ‘Mese cells draw out ksziter from the xylem vessels. The greater the %%quer loss by transpiration the greater will be the magnitude of the force. This force then pulls up the water in the xylem vessels of the stem from above. 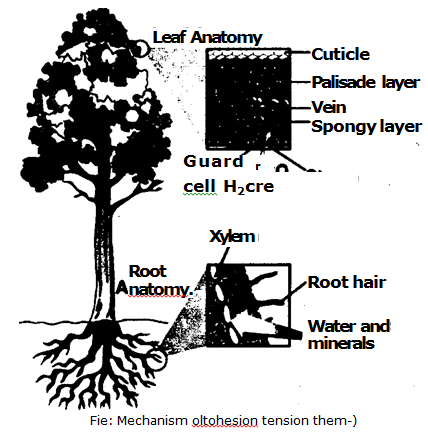 Root: “transpiration pull produces tension in the xylem. This tension is transmitted down the column of water in the xylem elements through the stem. It reaches the absorbing region of the root. As a result the whole column of water is lifted up. Water column: Cohesive forces are present between the water molecules. These forces maintain the continuity of %voter column in the xylem. The magnitudes of this cohesive force are very large. It may be 350 atm. This means that a force greater than 350 atm. is required to break a column of water. ‘Nese enormous cohesive holds water molecules together like a cord or wire. ‘The rising column of water is called transpiration stream.ObjectionsCohesion- tension theor% is the most accepted theory. But there are a fen objections to cohesion-tension theory . are bent severely in a strong w Md. It can break the column of water. This does not happen. The xylem ducts ha % e very narrow bore. Therefore. there is greater adhesion between water and the xy lem nails. It does not al low the water column to break.